WOW! Now this is Special! 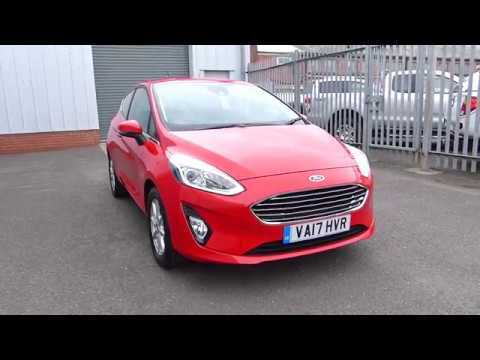 This Fiesta Zetec comes with all the latest technology such as a Trip Computer Hosted on a 4" Drivers Screen, DAB Radio, Bluetooth and USB Connectivity, Mobile Apps, Apple Carplay and Android Auto, Air Conditioning, Heated Front Windscreen, 6 Speed Manual Gearbox, Eco Mode, Traction Control, Auto Start/Stop, Manual Speed Limiter, Steering Wheel Controls, Voice Control, Lane Keeping System, Rain Sensing Wipers, Front and Rear Fog Lights, Automatic Head Lights, Electric Windows and even Electrically Adjustable Wind Mirrors. It really does not get any better than this! Finished in the STUNNING Race Red Paint and all with ONLY 4,377 MILES! You will not find another as well looked after than this! Buy with confidence from our family run, friendly Ford Main Dealership! For your PEACE OF MIND this vehicle will be prepared to the highest standard, will be inspected by our professional workshops and fully valeted ready for you to enjoy! Don't forget to ASK ABOUT OUR LIFETIME WARRANTY OFFER on this car!!! Please do call and pre arrange your viewing and test drive... our friendly, professional team very much look forward to helping you!